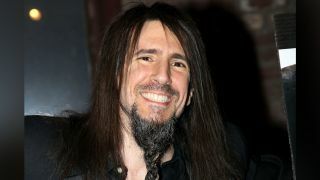 Former Guns N’ Roses guitarist Ron ‘Bumblefoot’ Thal has wished the band well with their upcoming reunion project. He spent much of last year fielding questions about his status in the lineup, saying that he couldn’t confirm or deny that he’d left because he’d been asked to stay silent. Now he tells Hek82: “It was a lot of fun. It was a lot of everything – but that’s life. Meanwhile, long-term keyboardist Chris Pitman has apologised publicly for criticising the reunion project. Guns N’ Roses continue to prepare for the first shows to feature Axl Rose, Slash and Duff McKagan since 1993, with Slash posting a picture of his new guitar pick. Guitarist Izzy Stradlin this week said he wasn’t part of the band’s reunion plans so far. GNR are the cover stars of the current edition of Classic Rock, on sale now in print, online and via TeamRock+.